View my interactive timeline here. Do you have a 101 list? 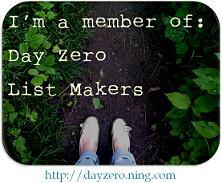 Check out Day Zero List Makers! Thanks for the link! Yeah, I kept finding things that I wanted to add to my list, so I decided on an “alternates” section. I think next time, I’ll just leave 15-20 items blank and fill them in later. Good luck on your list! Thank you! Completely makes sense… at least it does to me! That’s why I picked it :) I love that yours ends on Thanksgiving! Thanks! I know!! I’m definitely looking forward to checking back with yours too :) Good luck! Thanks for the link! Your list inspires me to want to add even more to my list… :) I’m sure that running half marathons and marathons won’t sneak there way onto my current list, but it would certainly be a good one to add after the first 101 is completed! I’ll be sure to check in on your blog to see your progress- it seems like you have already have a good start! On a totally random note, I was reading that your husband is from Iowa. I also am originally from Iowa- northeastern corner to be exact. Is he from the same area? I always get excited when I see that someone’s from Iowa. It doesn’t seem to happen too much when it comes to the blog-world! Thanks so much for commenting on my blog and adding me to your links list. I didn’t realize there were so many people doing this and had blogs like mine. Ooh, excellent list! I would love to go paintballing! I also thought about doing the A-Z challenge but ended up rejecting it… although I did find out there is a place in Germany that begins with X, which I think would have been the hardest letter. Thanks for checking out my list! I was worried about finding an “X” place to visit at first but I think there may be one not far from where I live (super small town but it will count lol). One of my favorite foreign films is The Butterfly and the Diving Bell. It’s a French Film. It’s really good, very sad, but good. Thanks! I’ll add it to my to-watch list! Hey Tara thanks for the comment. Love your list & good on you for sharing it and collecting other people lists as well. I will be checking in here from time to time to see how you get on. I’m thinking about getting a snitch, or the symbol for the Deathly Hollows. But I change my mind a lot…so we’ll see! I love your list. Thinks for the link to the ning group! Thanks for commenting on my blog…it let me to your amazing list! I’m be checking in to see your progress now, GOOD LUCK! Your list is fantastic! I really like your blog “My Day In Six Words” it’s such a cool idea! Nice list! I’m interested in following your blog. Thanks also for the link to Day Zero List Makers. I particularly like #83. Once upon a time I knew how to sign, but I lost that knowledge over time. I’m interested in re-learning. Know of any resources? Nice list and a good practice, very inspirational, i’m going to do my own. I got some great ideas from your list and i really like the “My day in six words” idea. Yay!! Congrats on getting it done! Be sure to post a link to it on Day Zero List Makers (http://dayzero.ning.com)!! Great list. I stole a few for my future list. I’m about half way through my first one. Keep spreading the news of 101 in 1001! You are doing a great job!